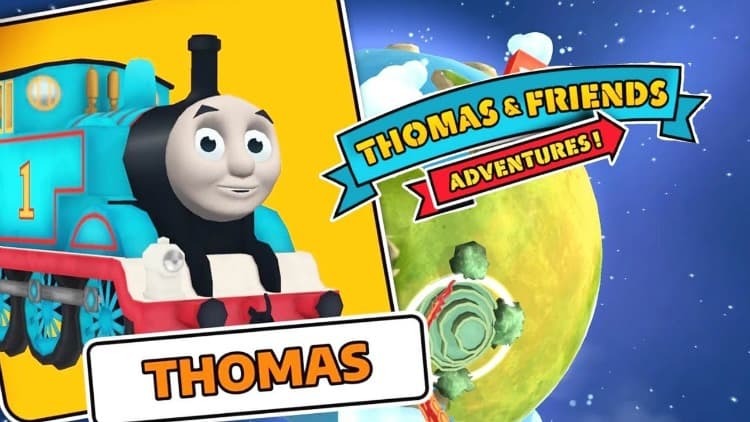 Check Out The New Thomas & Friends Adventures App With Fun Thomas Toy + Giveaway! Don’t Miss The New Thomas & Friends App, Plus WIN a Thomas The Train Toy! Thomas The Train is a favorite name in my household. Between my two children, ages 3 and 5, there is a lot of Thomas The Train talk around here. They love watching the show and pretending they are going on an adventure with Thomas & Friends everyday! It’s a wonderful show and my kids absolutely can’t get enough of Thomas! 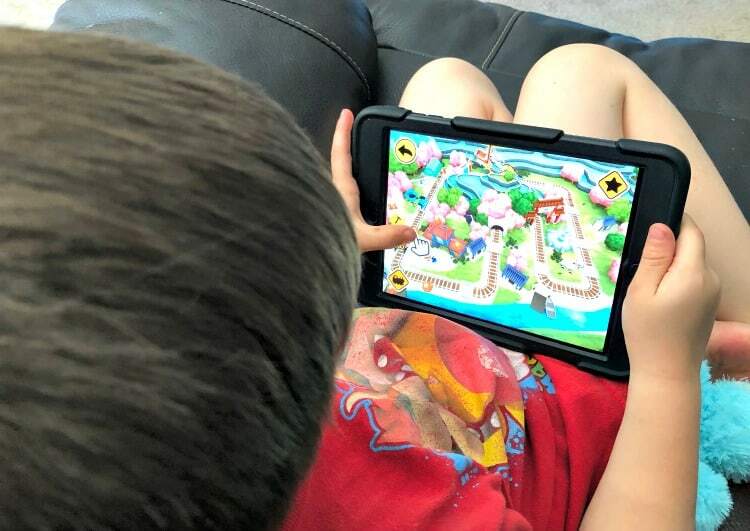 There is a new fun app called Thomas & Friends Adventures and my kids are thrilled! 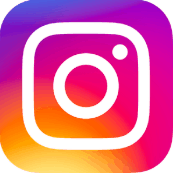 The app is about traveling around the world and putting different tracks together and following along the adventure of traveling! Between the app and their fun new Thomas & Friends Fisher-Price Push-Along Playset A Toy, they can’t get enough! Thomas & Friends Adventures App! Play the new Thomas & Friends™: Adventures! game and learn new things as you travel the world. Your favorite #1 tank engine and his friends are on an all-new adventure exploring the world, discovering new cultures and learning different languages in this game built specifically for kids! Inspire your little conductors’ creativity and let their imagination run wild with possibilities when creating their own train track sets. Figure out how to solve problems by helping Thomas and his friends with tasks only the toughest engines can accomplish. 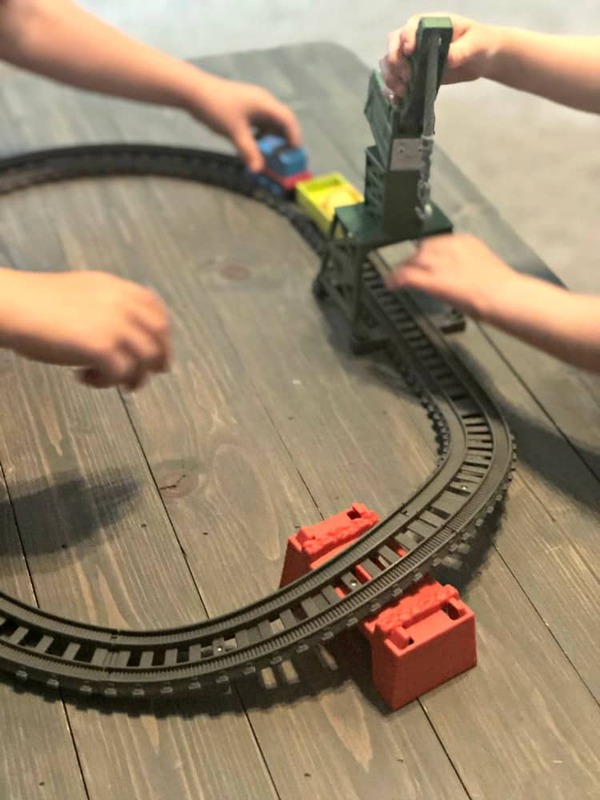 Listen to directions, play fun games and build the ultimate track in each country for all your favorite trains to enjoy! My son loves picking a different country to travel to with Thomas! He enjoys helping Thomas solve problems and build his own train track! Download on iTunes or Google Play. Thomas and Cranky have some work to do! 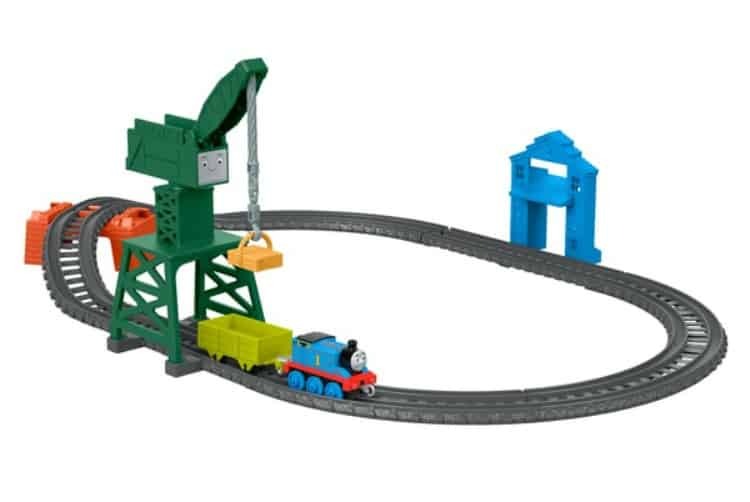 Use Cranky’s working crane arm to lift and load cargo into Thomas’ cargo car, then send Thomas around to drop it off at Brendam Fish Market. Can be used with other TrackMaster engines. This track was super easy to assemble and it’s very sturdy. 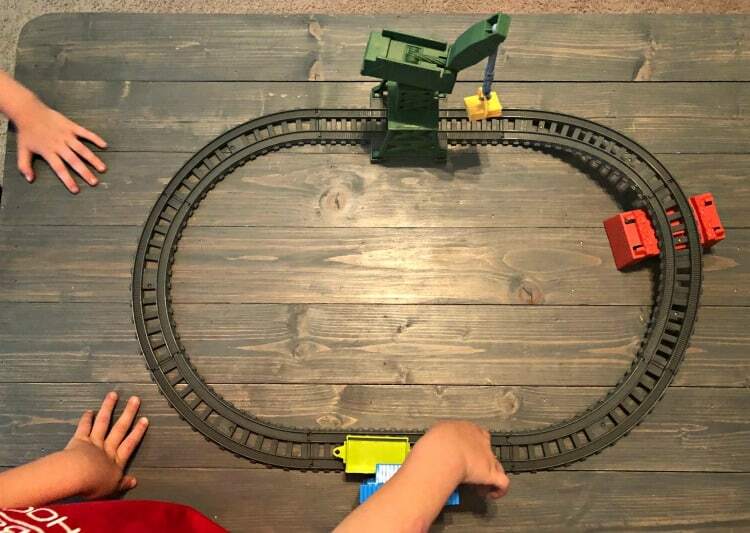 My children tend to play a little rough, but the tracks stay together while they zoom Thomas around the track. They love using the crane and loading the cargo into the Thomas’ cargo car! Thomas & Friends Toy GIVEAWAY! Win this fun Thomas & Friends TrackMaster Brendam Fish Market Toy! Your kids will love playing with their already favorite Thomas & Friends but with a new toy adventure! I have two grandsons who would love this Thomas & Friends toy, so hoping!! My child would definitely love to win this toy,he loves Thomas the Tank Engine and all his train friends,it’s also his favorite show. I would give this to a nephew and he would adore this toy! My cousins little boy Jase would love this. My youngest grandson would love to have this Thomas set! My 2 1/2 year old grandson has just “discovered” Thomas – he would love this! Our young Grady would love this. he is 3 and he loves trains. My friend’s nephew would love to have this. My grandson would definitely love to win this.